Two former Matlock favourites played integral parts in destroying their former club’s hopes of maintaining their unbeaten start to the season at the Northolme on Monday afternoon. Ross Hannah and Trinity skipper Liam King were both on the scoresheet in an entertaining game in which both defences looked far from secure. The Gladiators have looked vulnerable under pressure in their two away games so far and need to defend better as a team for the opposition have had a disturbingly excessive quota of opportunities. Matlock looked too open and needed a leader to see them through the periods of pressure. The Gladiators missed the organisational skills of skipper Adam Yates, missing with a knee injury for the second successive match so the back four remained unchanged from the draw at Scarborough. Adam Smith replaced Harry Vince in midfield with Jordan Chapell coming in for Ted Cribley. Jamie Jackson failed a late fitness check on a hamstring injury so Shaun Harrad and Kieren Watson was the front pairing. 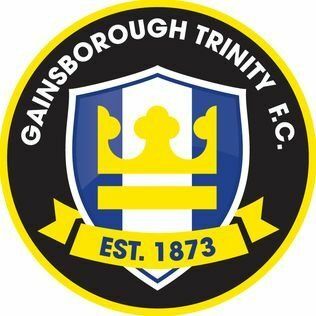 Gainsborough had an early chance to go in front when Richard Walton lost a right wing cross and as Trinity maintained their momentum, Walton made amends with a smart save from Damien Reeves. Michael Williams was thwarted as a half chance came his way and Dwayne Wiley headed comfortably wide before with still less than ten minutes gone, Alex Byrne shot across the face of the goal for the Holy Blues, before Reeves shot too high from distance. Walton spectacularly fingertipped Byrne’s strike over the bar before a save of equal standing from Jon Stewart in the home goal saw him tip a Harrad header on to a post. A goal had to come and two arrived in two minutes, one at either end. REEVES was on the end of a Byrne cross to loop a header over Walton in the 25th minute only for the Gladiators to strike back almost immediately, JAKE GREEN breaking forward on the right for his shot to strike a home leg and beat Stewart. Both sides were battling hard but it was HANNAH who restored the Holy Blues’ lead after 36 minutes. Neat interplay on the edge of the Town penalty box saw Matlock’s current record holder for goals scored in a season calmly fire past Walton from twelve yards. Walton held a long range Bryne strike, Wiley was well placed to hack clear when an Alex Simmons shot was too hot to handle and a trademark Hannah shot flashed wide to bring the half to an end. Matlock had a great chance to equalise on 53 minutes as Stewart pushed out a Williams shot as far as Harrad who could only fire the loose ball against the goalkeeper who then needed two attempts to grab substitute Charlie Dawes’ low shot. Wiley was again alert to mop up as Gainsborough broke at pace but Matlock found a second leveller in the 68th minute as Walton’s inch perfect long pass found Williams on the right who instantly crossed for HARRAD to knock home from close range. The game looked to have swung towards Matlock but Gainsborough found an extra gear to confirm a victory which took them to the top of the table with two quickfire goals. Walton held a shot from King but shortly afterwards the Gladiators conceded a needless free kick out on the right. Byrne delivered the ball into the danger box and SHANE CLARKE shot low into the corner with thirteen minutes left. Any hope Matlock had of recovering a point was dashed when KING thrust himself at a left wing cross to emphatically convert in the 79th minute.